Mr Graham Preston was the founding principal of Bethlehem College. He had for many years dreamed of establishing a Christian School in the Tauranga area. In November 1985, Graham called a public meeting to ascertain support for the establishment of a Christian school and the following year the Bay of Plenty Christian Education Trust was formed. Amalgamation with the Immanuel Trust of Auckland, who owned The Glade Motor Camp and Immamuel Conference Centre in Pauanui, and the sale of the Pauanui property enabled the new Trust to buy the school property freehold. We are all indebted to a group of Christian men and women who over a number of years sacrificed to build up the Pauanui Trust. The school property was purchased in 1987 and plans were immediately made to begin building. 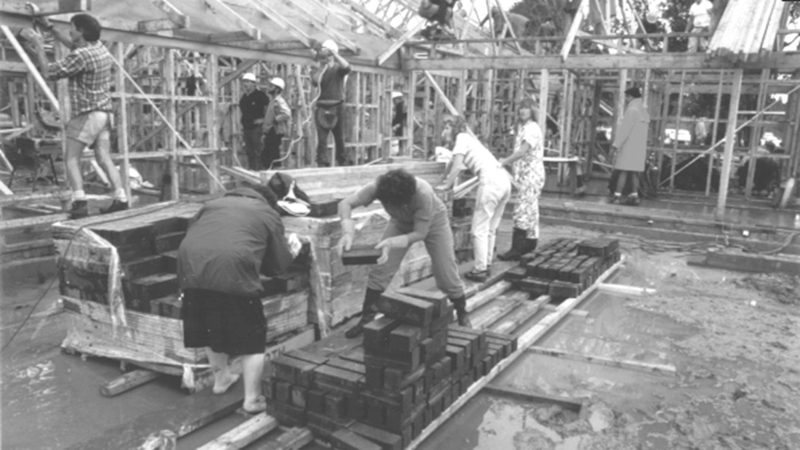 In March 1988, some 400 volunteers converged on Elder Lane to co-operate together in a well-planned ‘Quickbuild’ that resulted in the building of ‘A’ block in 3 days. Cyclone Bola, which caused so much devastation around the country, arrived at the same time so the conditions were less than ideal – very wet and muddy underfoot – but with an atmosphere of tremendous purpose and comradeship the building was finished by early on the Sunday morning which dawned with sunshine and blue sky and very tired but satisfied people. In the afternoon a time of praise and thanksgiving which was meant to be held outside the building was held in the new classroom as the rain decided to come down in torrents just as the celebration was to begin, but praise God we did anyway!!! From small beginnings the school has grown to over 1500 students and the Trust have added in a number of other educational entities, accompanied by growing infrastructure and resources to aid in the delivery of biblically based, Christ-centered education from early childhood to tertiary level.